How can I speed up the upload process? Who will be my Controllers? How can I take my system live? How will I get users on board? This page is designed to help walk you through the process of configuring your toolkit for the first time. Navigation through the pages is simple, choose the subject area on the left and you'll be guided through each of the sub-topics using the 'Next' (and back with 'Previous') links. Our home page and support also makes use of the following, but are not included in the myhrtoolkit application. If you want to sign up to myhrtoolkit, it's a simple process. We will need some basic company details, and you can be set up very quickly, often within a working day. There are no upfront costs in getting started with myhrtoolkit, and prices are governed by the number of users you will have in your organisation, see our price list for further information. Once your toolkit has been setup, an email will be sent with a link to log in for the first time. On following the link you will be asked to accept the myhrtoolkit Terms and Conditions. After the Terms and Conditions, you will be asked to set up some informal details about yourself, setting up the initial Controller user account. This includes the need to confirm the date of birth given on the application form. Also providing a username and password. Whilst a default username is suggested, it is recommended that you personalise the username to something that you will more readily remember. Please be aware that some usernames may already be taken by users in other companies using myhrtoolkit. You will need to provide a password. It is recommended that you use a strong password, including mixed case letters and at least one number. 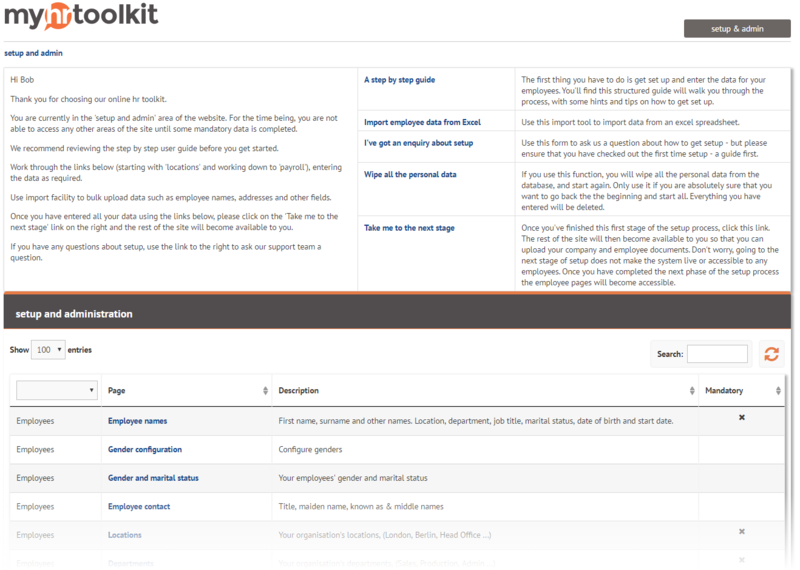 You are now ready to collect and enter the organisational details required to run your toolkit. The next section of this guide will walk you through what will be required and what happens with your data. It is worth spending some time in preparation for activating your myhrtoolkit. We recommend that you.. Gather the data that you will require; the more that is already 'online' the better as this will greatly speed up your data entry. Think about where your holiday, sickness records are kept as well as employment documents such as contracts, CVs and job descriptions. Consider what level of data you wish to apply before going live. The system will allow you to go live with a minimum level of personal data. You can however upload a wealth of data and documents before going live. Decide how much historical data you will include; both before and after you go live. Remember, you can always add data, documents and change settings after you go live. In order to accelerate the input of data into the toolkit, there are 4 automated upload forms. Documentation There is a range of support material available by clicking on the First time setup - a guide link within the set up screen. Service desk The myhrtoolkit Service desk operates UK office hours Monday to Friday. To submit a query for resolution, click on the I've got an enquiry about setup link within the set up screen. Think about your locations, departments and job titles. If you set these up before uploading your personal data you can include them on the personal details upload sheet. If you have international locations (outside the UK) you can set up local public holidays. Check that we currently support your local currency units. If we haven't included it already, let us know and we'll add it for you. The amount of resource you have available to do the work. How many people/ how much time will you allocate to setting up your toolkit? This is a very trustworthy position as your Controllers will have access to all information about all of your people. Too few controllers and you might not have cover for absences, too many and there is a danger of confusion with system changes being made by one unbeknownst to the others. Somewhere between 2 and 4 is probably best. Setting up the system and adding the data is the best way for a Controller to really learn about the system. After all, they will be taking the responsibility for its smooth operation once it goes live. When you go live, the system will automatically email a login link to each person along with an introductory email. The link is time limited, so do encourage your staff to act upon the email quickly. See our 'How to – Go live' guide for more information. It is important to consider how you will encourage your users to start using the new system, especially if it is replacing a previous on-line or even paper based system. Encouraging user acceptance is key to the successful deployment of your new system. Documents To help your people quickly get to grips with the system, we have produced a series of helpful documents – a full user manual, quick start guides covering all the basic functions and bite size 'How to' guides each covering a specific action. When you first access the System Set Up, you will be in 'Stage 1,' as shown below. This dashboard acts as a wizard for the different tasks involves in getting a new toolkit prepared for use. From the links in the centre column of the wizard, enter the locations from which your organisation operates, the departments you use, job titles, and define your standard holiday year (the default follows a standard calendar year). There are some additional items which can be configured, such as title and gender, but these are optional, and the toolkit has defaults. Each of these are straight-forward processes, but form the basic framework upon which the rest of the toolkit structure operates. Note – A document giving details of mandatory and nice to have items setup during this stage can be found here. Myhrtoolkit provides options for employees to self-identify as genders not limited to the standard binary Male/Female. Whilst the default options in a new Toolkit are Female, Male and Not Set, additional identities can be added as needed using the Gender Configuration option in the Employees sub-section in setup and admin. The import spreadsheet can accept any genders. If gender identities are included in the spreadsheet but not yet in your toolkit, they will be added during import. If there are spelling mistakes, these can be corrected later using Gender Configuration. Note – The Not Set option is fixed and cannot be removed. It is the default for new employees. Once the basic organisational structure has been set up, the toolkit will be ready to have employees uploaded. This is done via the 'Import employee data from Excel' link in the wizard. The page contains instructions with a link to a downloadable spreadsheet which should be populated with employee information. It is important that the structure of the file should be kept intact whilst the extra data is added. Additional codes used internally by the toolkit will be shown which should be used for Locations, Departments, etc. Further information can be found in the Guide to Importing Data. Existing holidays and absence information can be uploaded into your toolkit, however it is currently only available in Stage 1: Initial Set-Up. Cut and paste your data into the spreadsheet. You can leave columns empty, but you cannot create new headings. Please do not remove or change the numbers in the 'User Id' column. Having saved the spreadsheet on your computer, click on the 'Browse' button to select the spreadsheet and then click on 'Upload employee file' and follow the instructions. Uploading Emergency Contact information is accessed from line 19 of the options within the wizard. It is very similar to the importing of Personal Details and comes with its own instruction sheet. Once again, ensure that the spreadsheet formatting remains intact. Once you have completed the initial set up screen and clicked on the 'I've finished the set up process' link, you will see the message below confirming that you have input sufficient employee details and that the system has enough information to function. If there is critical information missing, the system will not allow you to proceed and will instead advise you of the area needing attention. When you click on the 'click here to continue to upload your company and employee documents' link shown in the above image, you will see the screen below. As a controller you now have full access to the system, but none of your employees do. In the Document Upload Stage you can add documents, or allow users onto the system, known as Broadcast. If you choose to broadcast, you will still be able to add documents later via Management > document library. Any induction materials you have. Any "general documents" your organisation uses (for instance expenses sheets etc). A guide for uploading and managing your document library can be found here. When you are ready to allow users to log in to your system, simply click on the blue 'click here' link at the top of the management tab – shown above. This takes you to the page below, where you are asked to check that all the system email addresses are correct. This is important as these will be used by myhrtoolkit to communicate with your employees. Once you are satisfied that all the email addresses are correct, press the button shown at the bottom of the screen shown above. The emails sent will contain a time limited link for each user to click to log in, creating their username and allowing them to choose a password. The link will remain active for 7 days. Technically everyone is 'live,' but only those to whom emails were sent will be aware of the fact. The option above can be used with an already live system. If someone is showing as 'Give access' within setup & admin > System Access, but has yet to receive their login details, you will first need to change them to 'No access' and press submit. You can then follow the above. In order to create managers in the 'initial set up' stage, the individual must be set to 'Give Access' within setup & admin > System access. Links sent to users giving access to the system are time limited and will expire after seven days. How to allow only a limited number of people access, perhaps key managers, to give them an opportunity to get to grips with the new HR tool. As you choose to make others live, go to setup & admin > System access, and tick 'Give access' for all those you want to make live. Once your toolkit is live and your employees are using it, we recognise that there may still be questions about how to do things, or 'what happens when I press this button?' We remain available for all your queries, and are always happy to help. We have an extensive library of support documents available via the website and from inside the app. If you have a more specific support question, you can log a request using our ZenDesk page, and one of our support team will be in touch to help. Note – Our office hours are 09:00 to 17:30, UK time. This is a comprehensive review, areas examined in the Toolkit MOT are.. Note – The Toolkit MOT and any recommendations do not constitute HR Advice.